After having marveled at the world’s smallest flash drive here we have the next superlative. This one is brought to us by TopTech Products. The world’s thinnest memory stick! It’s so thin that you can’t distinguish it from a credit card. And just like a credit card it also fits in your wallet. So next time you don’t get approved for your new platinum gold silver diamond express you can find solace in your slim data USB card. Because with 4GB it sure holds a lot more than a credit card does. And hey – being the owner of 4,000,000 KB doesn’t sound too bad either, does it? In effect that makes you a millionaire. And if you go bytes, then that’s a 10-figure 4,000,000,000 B. B for billionaire! Woohoo! Ok, back to the specs. The slim data flash drive comes in 5 different colors. Orange, Red, Blue, Clear and Smoke. It’s 3.54 inches long, 0.1 inches wide and 1.97 inches tall. That indeed makes it the world’s thinnest flash drive. And if you wonder about the weight, that’s a meager 0.02 pounds. If you think it doesn’t get any cooler then check this out. 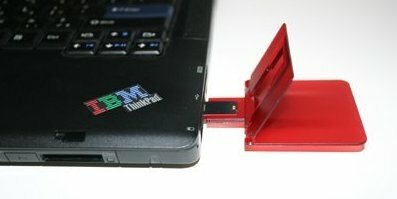 Our slim data memory stick can also be customized! What a gag it would be to imprint it with a Visa or Mastercard logo so that next time you’re on a shopping spree you can hand your credit-card flash drive to an unsuspecting cashier. If he or she catches on just say that you always wanted to know what it feels like to be a billionaire. I really like stay up on the latest on these, this is really cool! Very neat! It is amazing how far the technology for these devices has come… who would have thought products like this would exist ten years ago?! They look pretty slick indeed. Never seen something so slim. It does make you wonder though if its possible to get any larger data storage above 4GB on something as slim as this? Don, yes it is. Check out the Kingmax Super Stick, PNY Mini Attache or Super Talent Pico.